What should I do with this bathroom? ForumsArrowRehabbing and House FlippingArrowWhat should I do with this bathroom? Obviously tear everything out, but should I put in a vanity, and then leave the spot to the right of it empty? Depends on budget, timeline, how the house is built/laid out but I'd lean towards a double vanity as you have enough space there. If your ARV doesn't call for that, you can leave that open space there, although it looks awkward. What about putting a double vanity in? It looks like you have enough room unless there is a toilet blocking it. If a toilet is blocking, I would provide as much storage space as possible. Could another cabinet of drawers fit in there? Could shelves be installed on the right for baskets & towels? That would be better than the current open space for a (dated) vanity that is there now. @Patrick Philip I looked at the image. Double vanity is option number one. Don't put in open shelves - the area is too deep and they would just look messy - and I don't like that exposed plumbing on the back wall. Looks like about a 36" area? 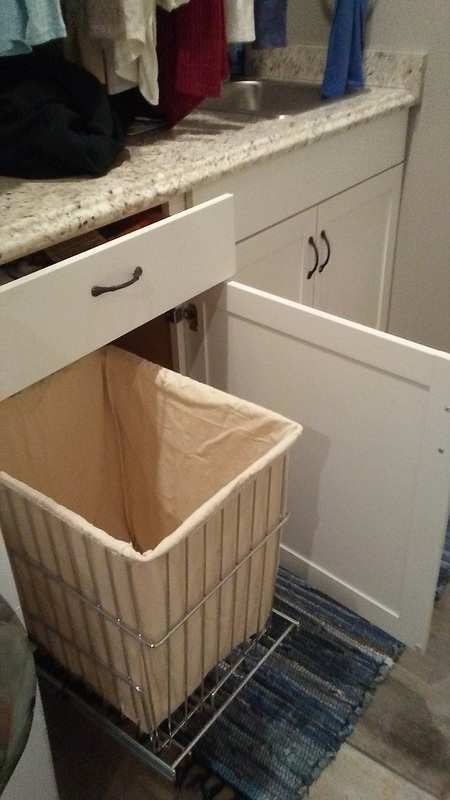 I would buy a 24" cabinet and install a pull out laundry basket and then you only have a 12" space or so... that can be used for storing the toilet brush and a decent trash can OR a pull out towel rack. I like to add these little fun touches to my projects. The attached photo is from my personal laundry room. Everything came from Lowes.